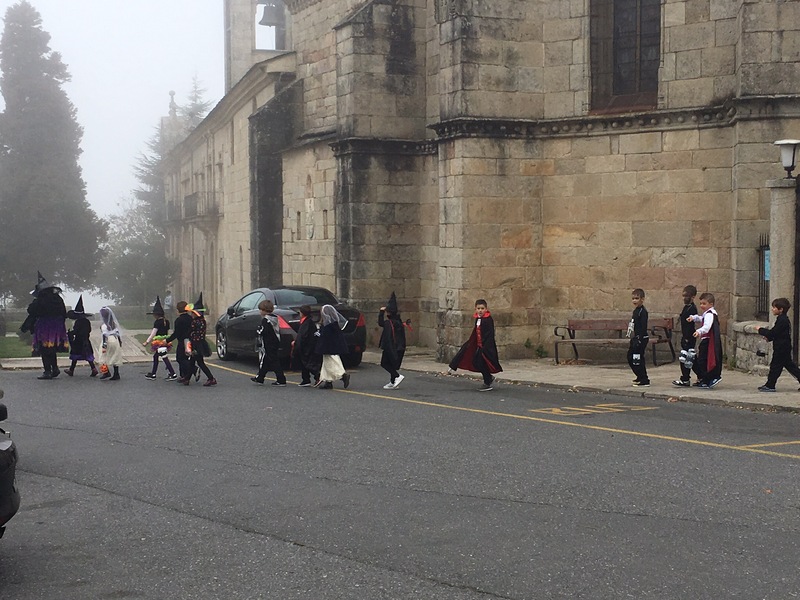 We left Muxia early, on the 6am bus, arriving in A Coruna after 8 some time – and no, it took much longer than 1:18 as we stopped at numerous small villages. Our first step was to stow our packs at the bus station, find a wifi cafe for coffee and find a place to stay for the night. 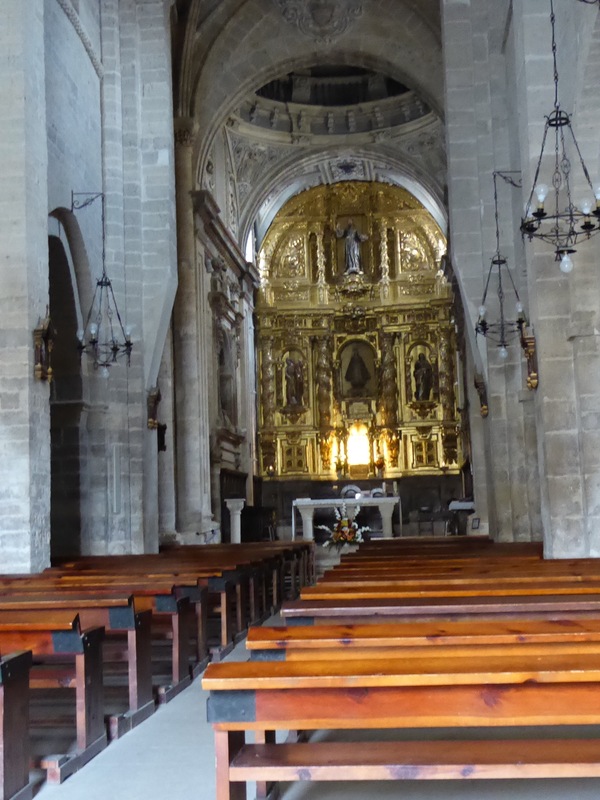 That accomplished, we set off to explore this Galician coastal city – there was lots to see…. A Coruna has a most unusual layout…. With the port on one side…. And the beach on the other…. A Coruna boasts the world’s oldest Roman lighthouse called “The Tower of Hercules.” It turned out the Romans built very comfortable stone benches (at the base of the lighthouse) where we caught a 30 minute snooze in the sun. 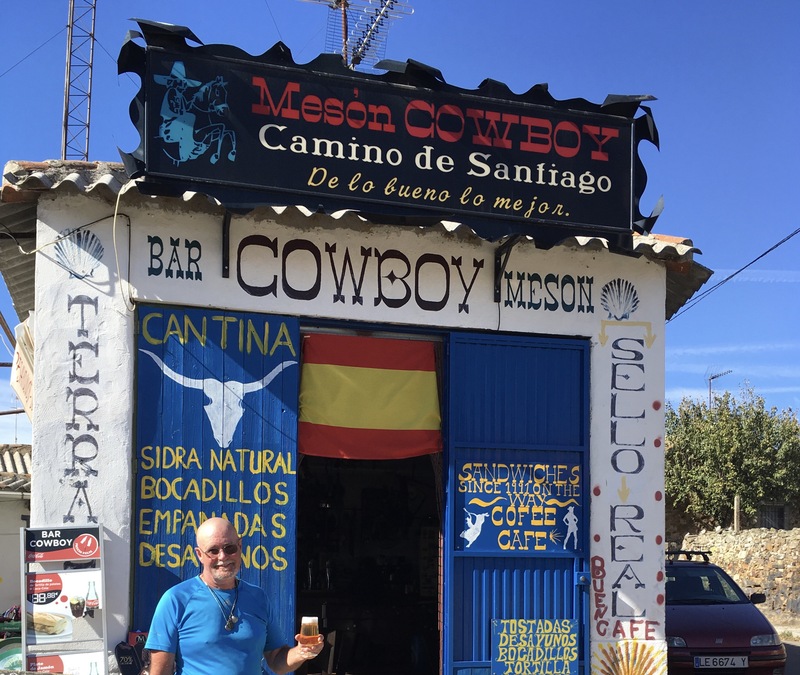 After more than 15km of exploring, our feet protesting, we stopped for “Nordes” Gin & tonics in the sun, recommended by a couple of pilgrims we met there. It was a most interesting-flavored gin – excellent!! Today, we visited the old city and happened upon a most beautiful old church dating back to the 13th century. The door was open so we went in. An unseen male choir was practicing – the most beautiful chanting/singing was coming from somewhere inside. We sat listening, enthralled, for a long time. It was the day for church and monastery visits I guess as we kept coming across them with their doors open. We happened by at just the right time because later, their doors were all locked up tight. 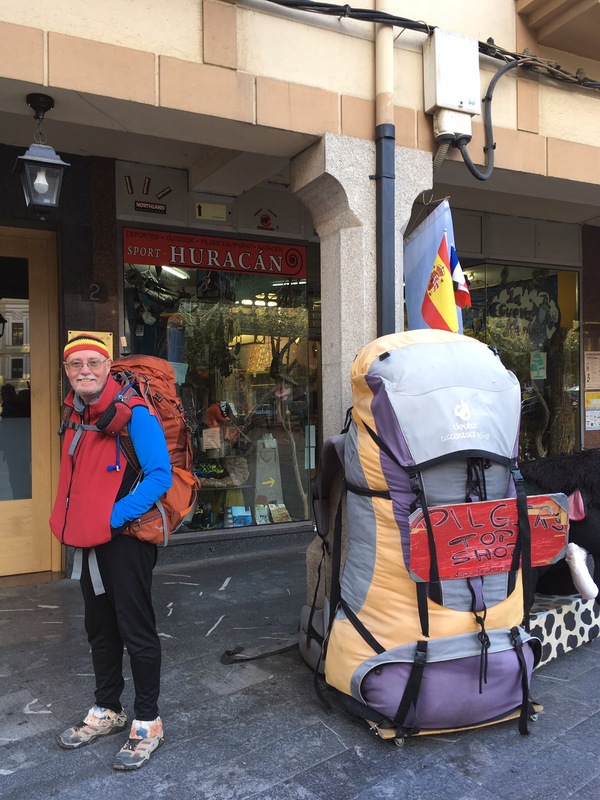 Checked the weather forecast – wind and rain for A Coruna tomorrow so we are heading east along the coast to check out the next town – either Gijón or Bilbao. 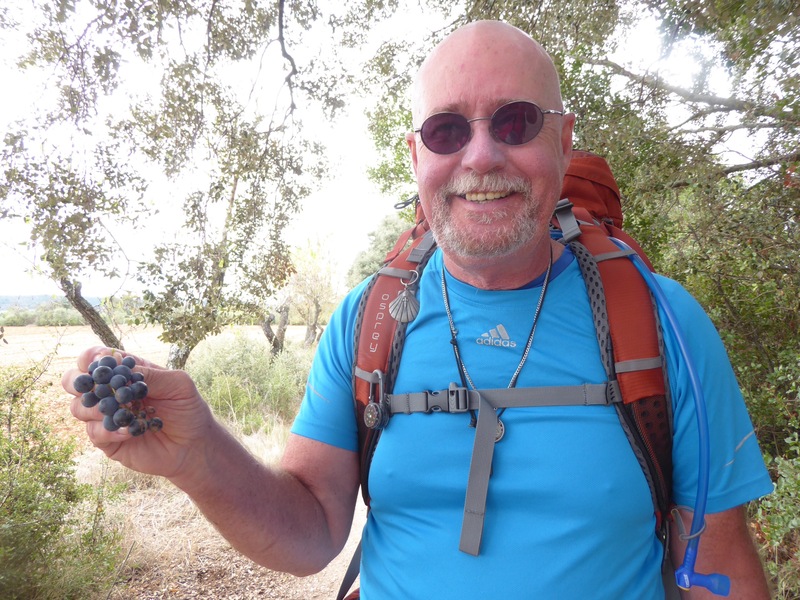 “The people we meet along the way…” -My answer to a casual question – “What about the Camino have you found most memorable?” – asked over a Pilgrims meal. 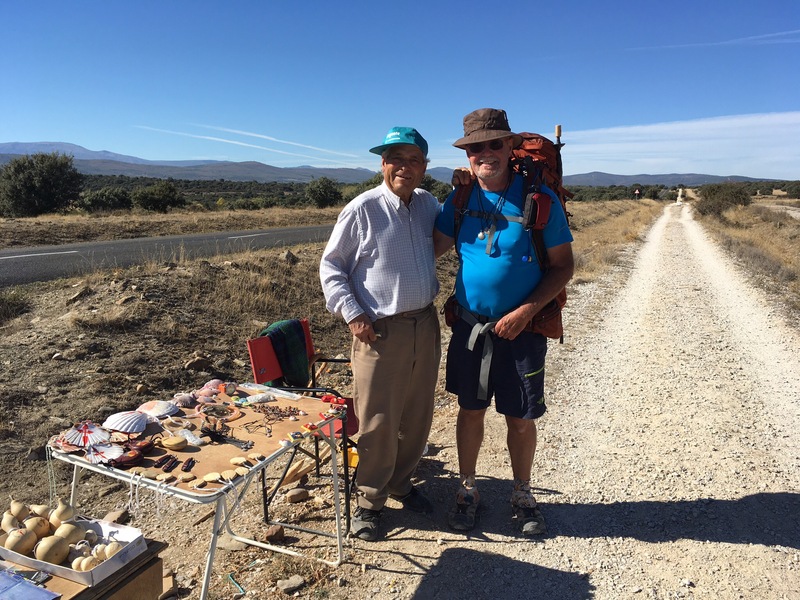 The Camino was an international walkway where we met South Koreans, Japanese, Chinese, Germans, Poles, Hungarians, Dutch, Austrians, Swedes, Belgians, Spaniards, Americans, Canadians, Mexicans, Brazilians, Australians, New Zealanders … so many that we lost track. And even though most spoke some limited English (not surprising), fewer spoke any Spanish. 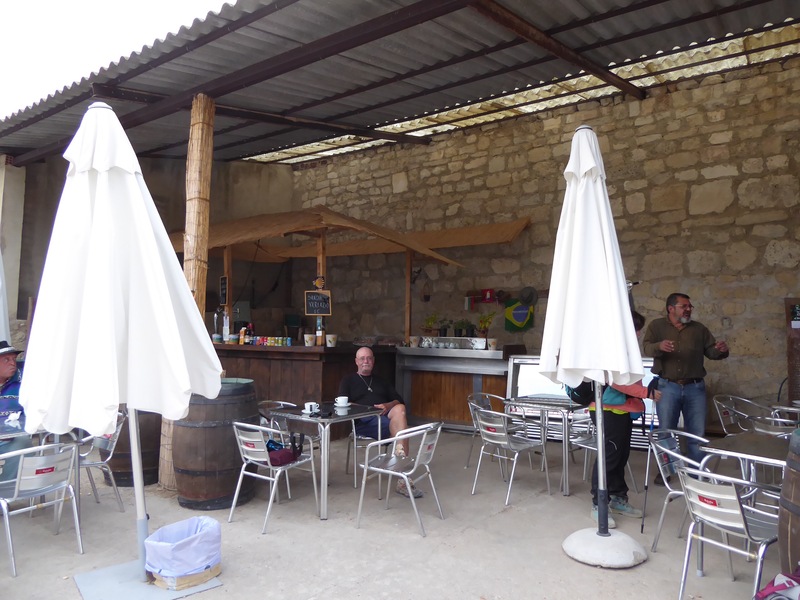 Which was very surprising to me, since most cafe & albergue staff had little English or any other language skills*. Still we managed to communicate. The character who posed the question was a Galician Spaniard. 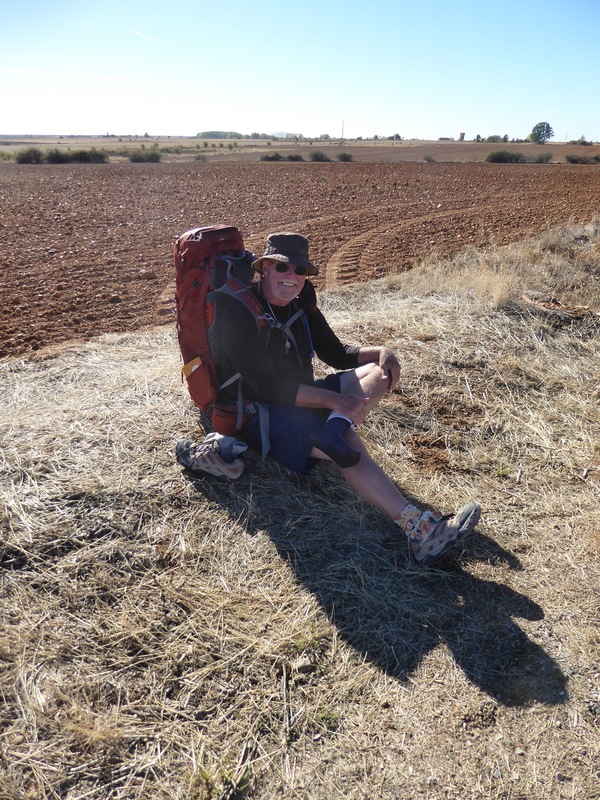 He grew up near Santiago and was walking the Camino because “for years I’ve seen people from all over the world with backpacks on, entering the square of the Cathedral at Santiago, some crying, some laughing… others collapsing and just sitting… all after walking this thing called ‘the Camino’… SO I thought maybe I should try it to see what it was all about.” He had walked 110 km in a week ( all the vacation time he could spare) and was heading home via bus the next morning. I asked If he had discovered anything. He responded “No… not really”, with a laugh. “Mik-hile” (he gave himself this nickname because his real name was too difficult to get westerners to pronounce properly), a twenty-something South Korean man, was the only other person at one of the first albergues we stayed in. As we unpacked I watched as he wandered the rooms holding his smart phone up over his head then down to check it… took me a few minutes to figure out that he was looking for … I asked, “No WiFi?”… he looked at me puzzled- so I said “INTERNET?” and he replied “NO Weeee Feeeee… very sad.” A laugh and shrug… As we enjoyed the evening meal using limited English & pantomime, we teased him about being young enough to be our ‘grandson’. Along the way over the next weeks we would suddenly hear “GRANDFATHER… GRANDMOTHER” as Mik-hile jogged up to give and receive a hug… We were always as pleased to see him as he was us. Olivia was another South Korean. 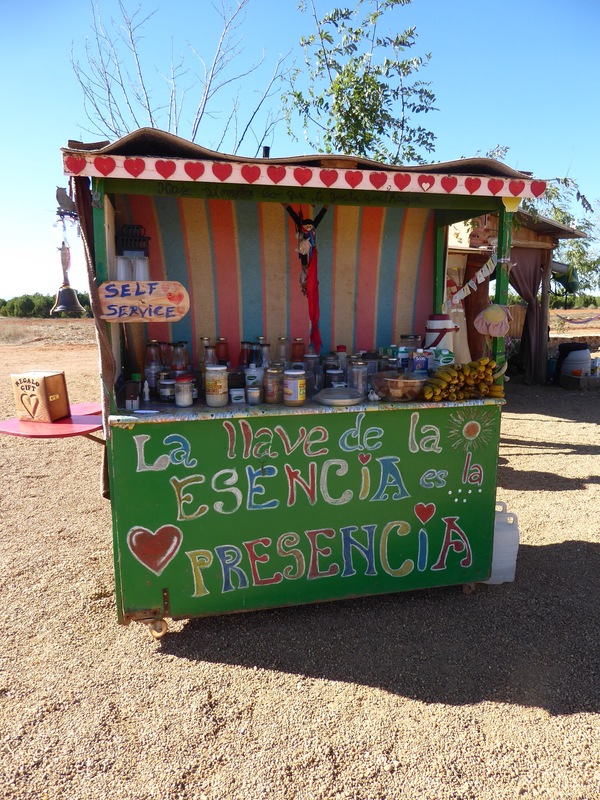 She became known along the trail as the ‘Buen Camino Girl’ because of her exuberance when meeting or even seeing other pilgrims; yelling “BUEN. CaMEEEENO!”. You could hear her from blocks away. Sel-Soo (phonetically spelled because I have NOT a clue how it should be) was a Brazilian man we kept passing and being passed by. We would smile, he would smile…and then exchange a “Buen Camino”. One evening being the only ones at the restaurant, we shared a table and a meal. Broken English and pantomime sufficed for our conversation. 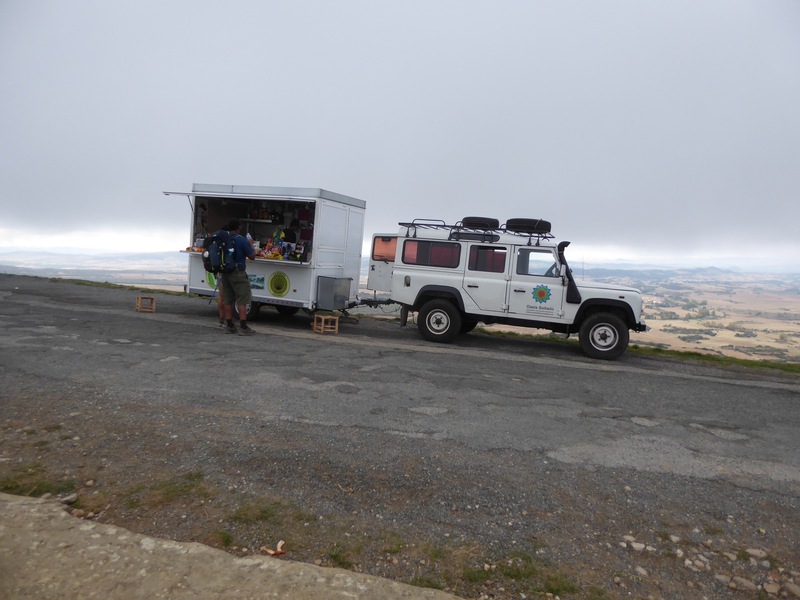 TWO weeks later we were approaching Palas de Rei and saw Sel-Soo waiting for a taxi. He was going into the next largest city because his legs hurt BUT, more importantly so he could eat some “pulpo” – pronounced POOL POE – a local delicacy. Apparently Palas de Rei is famous for it. Tilly asked “what is that?” Sel-Soo responded, “pulpo, pulpo… poooool-POE!” as he searched his memory for the English word… I laughed and then- having seen it mentioned on the menu – say ‘octopus?’… “YES – PULPO!”, he exclaimed and we dissolved into laughter. Bern, an Irishman made my memory list when after learning about the Las Vegas mass shootings said “The whole world is broken.” We all shared a moment of silence at the table and nothing more could be said about it. The Canadians we met were dominated by British Columbians (and mostly Vancouver Islanders) but we met the odd Québécois, Albertan & Manitoban. Americans came from all over… Massachusetts, Georgia, Oregon, Washington (state & DC), Colorado, California, Texas are a few of the states I remember. OH yeah and we all avoided speaking about politics and ‘you -know-who’ back home. 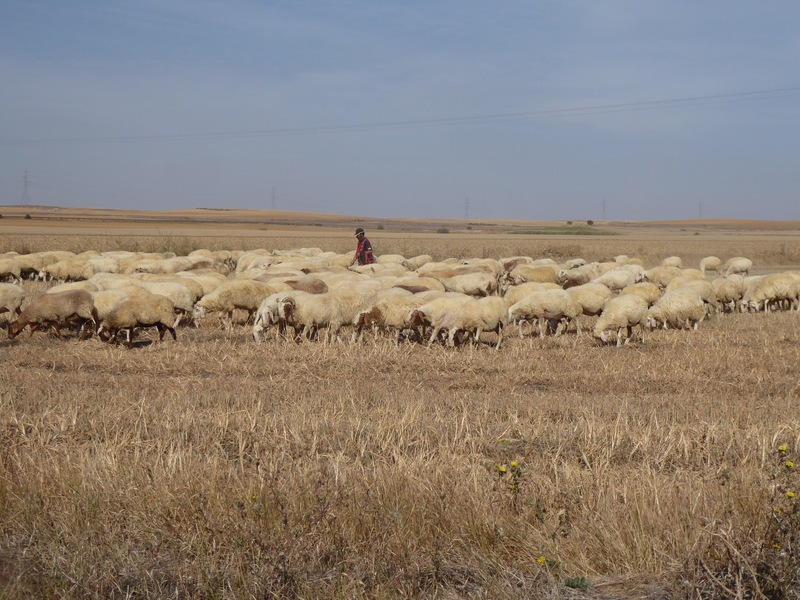 Rich, a young American, was walking the Camino as a break from his volunteer work as a school counselor in Ghana. We remember his smile and positive manner. He walked fast and quickly out paced us so, we were surprised to catch up and pass him a few days later. Until, we saw how he and his new walking partner Katerina were interacting… I don’t think either of them were in any hurry to finish the walk….good for them. Other nationalities I have not listed here include Swedish, Austrian, Polish because they fit better into one of my other groups. 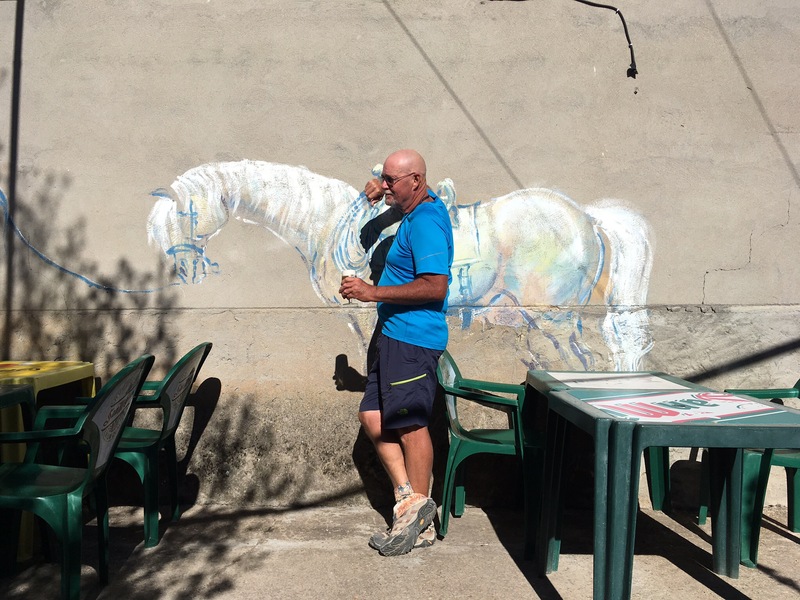 *HINT – Learn some basic Spanish IF you are going to walk the Camino – you’ll wish you had learned more! We are in Muxia. It’s our 9th day here – we have another 5 days before heading off on another adventure – the adventure of getting back to Paris and from there – HOME! You can clearly see the peninsula and the 2 hills shaping it. We have lots of windows: when we look out the bedroom and dining room windows we see the sunrise in the morning and we see the business side of the village….the port where the fishing boats come and go….the restaurants and bars….and so on. When we look out the extra bedroom and den windows, we see the other side of the peninsula…the other side of Muxia….more residential….and we see the sunset….when the sun is out that is! When we go walking every day, we choose which way we want to walk around the peninsula. At the other end of the peninsula is another large “hill” on top of which is an old stone cross and at the top of which you get a 360 degree view (I call it Stone Cross Mountain). Just past that hill is an old church (which I believe still celebrates Sunday Mass every week).From the church you can descend onto the rocks that form the northernmost point of the peninsula and those rocks I call the “Martin Sheen Rocks” because that is where, in the movie “The Way”, he tossed the rest of his son’s ashes. We also call it “The End of the World” (although Finisterre has that official but dubious honour) – the waves roll in all the way from N.America with nothing to stop them. It’s a most beautiful spot and we have spent a part of each day there, just sitting on the rocks, watching the waves crash in, always in different sizes, formations, directions, volumes, and shapes, marvelling at the amount of energy unleashed by each one. Every day we walk in one way or another around the peninsula. Sometimes we walk in an entirely different direction, towards the mainland. Then we encounter a couple of beaches, a wooden walkway, and a little used road that wends its way around another point before it stops. Wherever we go, it is beautiful. The previous week was stormy, windy, cold, and either rainy or misty. This week has started with blue, blue sky and sunshine. SPECTACULAR!! So that’s Muxia. Yesterday we went to Finisterre, just a short trip by bus south, down the coast from Muxia and it too is beautiful but much bigger and much more touristic. The big attraction is the old lighthouse at the very end of the point, the very “End of the World” as they believed in the medieval days. We sat and contemplated Camino experiences; enjoyed the sun; admired the lighthouse; dipped our feet into the Atlantic Ocean; sipped wine. A great day bu still, we are happy we decided to stay in Muxia. Despite the quiet beauty of this place, I must admit to a certain feeling of dis-ease….a very strange sort of feeling that is difficult to describe….boredom maybe? Homesickness maybe? A feeling of ‘not knowing exactly what to do with myself.’ We walk, talk, eat, sleep, cook….all of the everyday things one does at home so why do I feel so much dis-ease? I think maybe it’s because for almost 40 days, I knew exactly what each would be about…walk, rest, eat, walk, rest, drink, walk, eat, sleep and repeat the whole thing 40 times. To all of a sudden stop …. well, I find I am confronting my issue of always needing to be busy: teaching with all of the tasks that made teaching so satisfying (and frustrating too) being with kids, watching their amazing variety of learning styles, seeing them grow, marking, planning, creating, organizing….and more; with the chores of daily life; with physical fitness; with going adventuring and discovering new places, making new friends….! All of a sudden, I don’t have “things to do” and I feel restless…like a turtle hibernating in its work shell and only now pulling my head out, looking around and seeing the world in a whole new light. Michael and I talked about “walking into retirement” and now I laugh because that’s exactly what we did … inadvertently …. 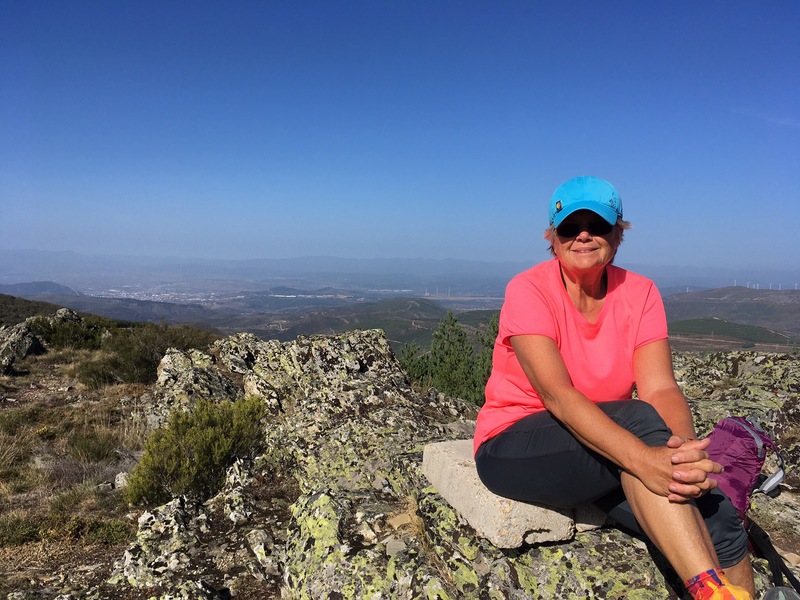 because the “Camino gives you what you need” we heard from several fellow pilgrims….you get the life lessons you need….! So yes, we are receiving our respective lessons now. The joke is on us! 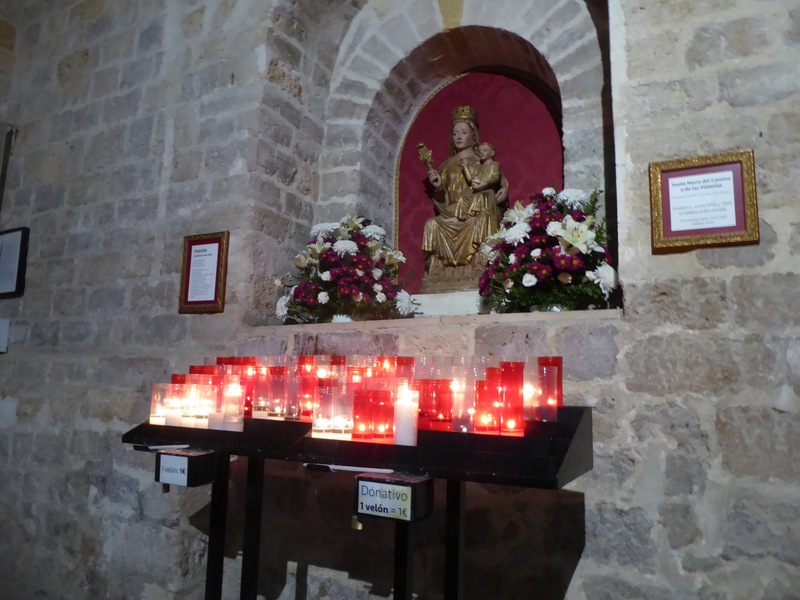 Almost every morning I/we awoke to some fellow pilgrim complaining about the SNORING and not being able to sleep. 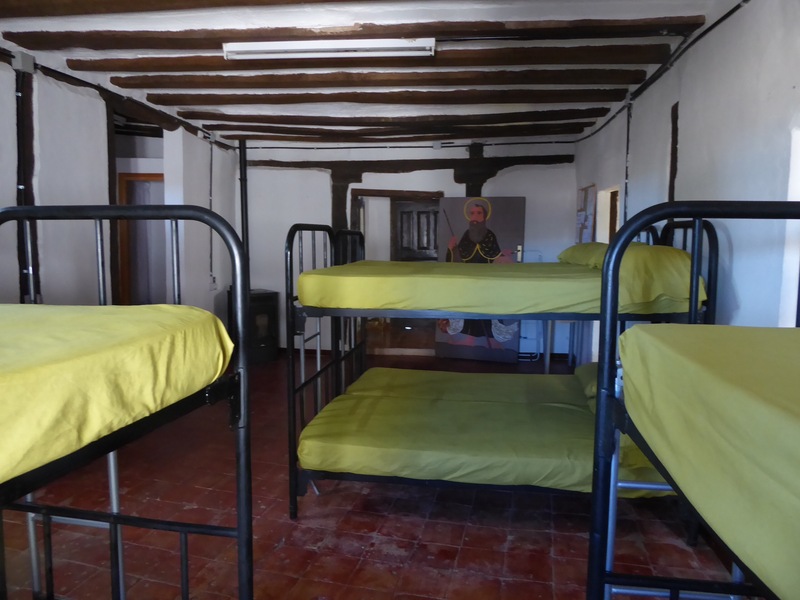 Just to be clear: EVERY albergue has a ‘snoring problem’ and with rare exception, EVERYONE snores… YES LADIES – even YOU! People snore LONG & LOUD – first, when they are TIRED & second after they have had a few drinks. Combine a large group who have walked a 20+km day, then consumed the cut rate “Perrigrino Menu” which usually INCLUDES lots of WINE… AND the RESULT will be a LOUD & most cacophonous concert that night. Rather than complain, I thought about solutions. After all we were warned. 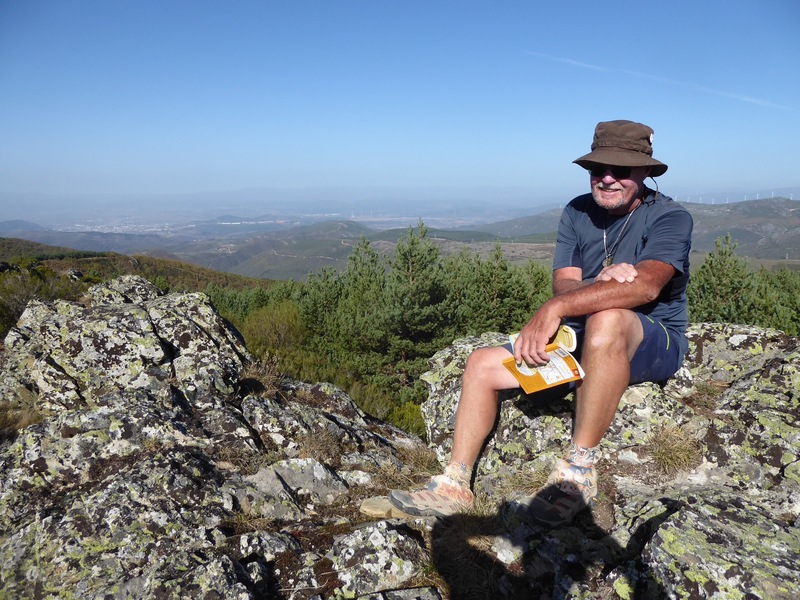 Every Camino guidebook stresses the need for ear plugs when planning to stay in albergues. From my perspective they are an ESSENTIAL – CRITICALLY IMPORTANT piece of gear. So important that I would even say 2 pairs are advisable – just in case. GOOD EAR PLUGS – NOT some cheap foam ones that the airlines hand out; BUT high quality – GONNA let you sleep through WWIII EAR PLUGS. Before we left the states, Tilly and I purchased 2 pairs each of silicone earplugs that deadened the snores so much you could hear your own breathing. Only problem, for me – comfort. I would usually wake up in the middle of the night take out the uncomfortable ear plugs and lay awake for a while, exposed to the full intensity of the noise. The first night, I braced myself for a sleepless few hours… wondering why I consented to sleep in one of these places. Sure enough there were dozens snoring! But, before I could manifest my frustration, I perceived a rhythm. Some of the snores were synced with others. Patterns began to emerge. Then one section of the room seemed to reply to another section. It was a symphony of nasal obstructions that I was hearing. Instead of being aggravated I became fascinated. Soon I fell easily back asleep. Most nights in albergues, I seemed to be hearing different concerts. The snores, puffs, squeaks, sighs, humps, whooshes, all blended … I began to name the nights… The Somnambulist Symphony, The 40 Wink Opera, The Snorers Sonata, but the best and most memorable performance was in the public albergue in Leon -The Barnyard Concerto. I awoke to the sound of a cow. ‘Humpf…moooooooooooo’ -‘Humpf…moooooooooooo – then a pig joined in ‘huck…eeeeeee’ …. ‘huck…eeeeeee’ …. ‘huck…eeeeeee’ … chickens clucked… dogs barked… cats meowed …. climaxing with a tractor starting … sputtering ‘puh’ … ‘puh’ …. ‘puh’… the farmer muttered something unintelligible … AND then the cow started the sequence over again. I swear it went on for an hour or more… but who knows… I fell asleep smiling. But before I make sleeping in albergues sound idyllic, as is wont to happen there was the occasional concert crasher. The Irishman was one. When he snored it was as his neighbor said the next morning, “like a bloody 747 at full throttle pulling an 8 hour long freight train”. I was three beds away and even the super-duty earplugs could not entirely stop the roar. And there were the nights of raucous partying by the locals in the bars located directly beneath our accommodations… one lasting until 0430… On those occasions I thanked the makers of our ‘industrial grade’ ear plugs…. 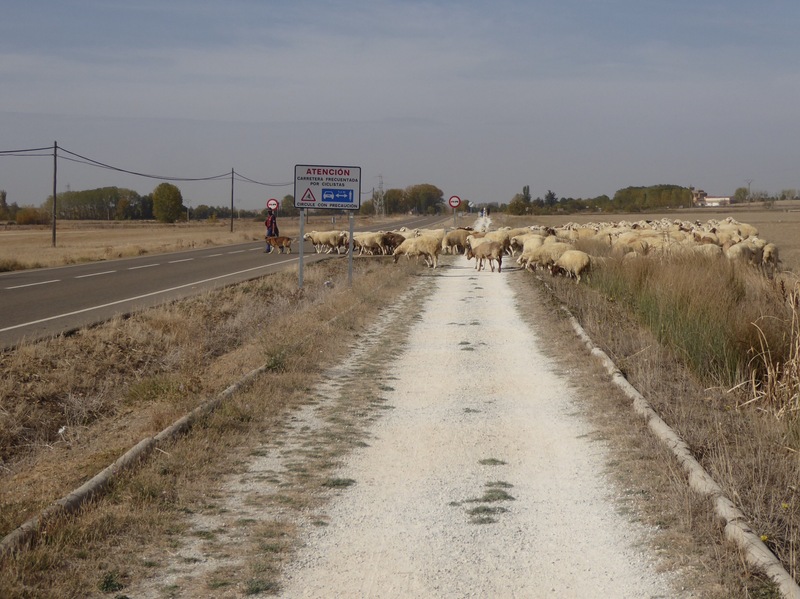 So, if you are planing a Camino walk… pay attention to the warnings of the movie and guidebooks… take some darned good ear plugs. It will help to throw in your imagination and sense of humor.